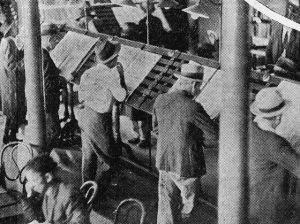 Since the invention of modern printing, newspapers, newssheets and pamphlets, and in the 20th century radio and television, have been the vehicles of free speech, open debate, and democracy. Editors and journalists have marked their times, popularising new ideas, shaping thinking, and uncovering wrong-doing. Every effort to censor or block news only serves to underline this potential for sharing ideas and driving change. That such efforts continue is testimony to the power of free media, and underlines the continuing need to insist on the protection of journalists. Libraries, in taking a strong stance in favour of freedom of speech, are natural allies. There are other threats though. Changes in the advertising market, and competition for people’s attention, has undermined the business model of ‘traditional’ newspapers, forcing difficult decisions about charging for access. Many have simply closed, or been taken over. Some have chosen to provide more ‘clickbait’ as a means of earning more from adverts, arguably contributing to the ‘fake news’ phenomenon. Others are seeking to change copyright laws to try and extract greater revenues from news aggregators sides such as Google News through ‘snippet taxes’, regardless of the harm this will do to libraries and Internet users in general. There’s no lack of writing about fake news or snippet taxes. IFLA has also often underlined the risks posed by ‘right to be forgotten’ laws, which threaten to limit journalists’ freedom to write, and see their work maintained online and accessible long-term. However, in addition to getting involved in these high-level discussions, there are also interesting initiatives taking place on the ground – libraries which are working to ensure that there is a demand for a free press, and supply of quality journalism. A blog in January by David Beard on Poynter set out the potential, telling the story of Mike Sullivan, director of the public library in Weare, New Hampshire, United States. 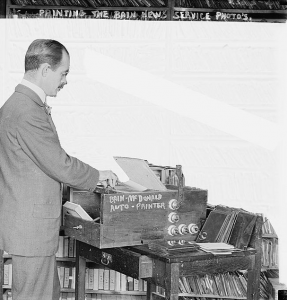 When the town newspaper closed down, he set up his own from the library, reporting on local events and activities. This has brought new interest in local events, reinvigorating the community. This example is not unique – in Zákánsyszék in Hungary, the local librarian, Edina Paraginé Tóth, started to work for the local newspaper fifteen years ago, wanting to help improve its quality. From this, she moved on to writing a column, and ten years ago helped set up an association to take over the newspaper. She is now on the editorial board, helping shape the direction of the newspaper. There is a degree of shared purpose between librarians and journalists. David Beard, in his article, highlights the sense of public service, as well as the focus on information as key areas where librarianship and journalism can come together. This is more than just a convergence of values, but also of practice. David Beard cites Tom Huang, who has worked with the Dallas Morning News among others to organise classes which can get locals – and in particular the young – interested in journalism. The State Library of Queensland has run projects, and there are further examples from earlier this decade in a blog by Barbara Jones in American Libraries. David Beard does argue that this sort of collaboration is unlikely to be behind the next Watergate, but underlines the importance of developing local connections, and the fact that for many people, local information is what matters most. This includes, of course, information about what libraries themselves are doing, as a recent piece in Mediashift highlighted. But maybe there is scope to go further? In a further piece in The Atlantic, David Beard notes the video news site run by the main library in San Antonio whose video coverage of a mayoral debate recorded the comments that may have contributed to the incumbent mayor’s subsequent defeat. And there are examples of libraries are also helping people take advantage of open government data policies, a key way of holding those in power to account, for instance in California and Washington. This last example perhaps highlights the fact that cooperation between libraries and journalists has a lot of potential. Practically, drawing on traditional skills and new technologies, libraries can facilitate new forms of journalism. As physical spaces, they can also help young people engage with journalism, whether the goal is to encourage more people to pick up their pens, or simply value newspapers more highly. Politically, there is strong potential to work together to build and preserve the healthy information environment needed for both to thrive.